Finally, a love story for grownups. It’s Downton Abbey without all the pomp and circumstance and a heroine who is not afraid to get her hands dirty. Just as in 2005’s wonderful Pride and Prejudice (Seed Cake Drenched in Cognac), Far from the Madding Crowd is the way love ought to be, the way it was destined and designed in our hearts. Built on the solid underpinnings of character, goodness, and honor, its fruition is evermore so sweet because it is so long denied. Of course, all that said, the path to true love never is an easy one. And one of its chief obstacles here is Bathsheba Everdene (Carrie Mulligan) herself, the independent, if not willful heroine, who seems to prefer farming to matrimony, her only “husbandry” interest of the animal kind; i.e., her sheep. Perhaps it is Bathsheba’s very reluctance towards marriage that makes at least three suitors fall at her feet. “Well, what I mean is that I shouldn't mind being a bride at a wedding, if I could be one without having a husband,” she explains to Gabriel Oak (Matthias Schoenaerts), the sheep farmer who first proposes to her. Resolute, unselfish, and enduring in his understated love, the shepherd lives up to both his first and last names. William Boldwood (Michael Sheen), the prosperous landholder who pursues Bathsheba, does not handle her rejection as well, obsessing on plans to win her love. Gabriel cannot help but see his suffering and taxes Bathsheba for her frivolous jesting Valentine that ignited Boldwood’s passion. The headstrong Bathsheba, of course, after asking his opinion on the matter, shuns Gabriel for his candor. Perhaps the dashing soldier, Sargeant Frank Troy (Tom Sturridge), has the best scheme, with his crisp red uniform and expert display of swordsmanship, he makes a full frontal attack, brash confidence and open passion his weapons of choice. While the love story is always simmering there in the background, the film has other merits. It takes us to a place long ago and far away, with no disturbances from electronic gadgets and teaming crowds. Too many current films, such as Furious 7 (Arabic Fattoush Salad Recipe), Ex Machina (Brown Rice and Black Bean Salad Recipe), or The Avengors: Age of Ultron (Sausage Egg Country Casserole Recipe) merely amplify this technocratic existence, dwelling on machines more than on mankind. Far From the Madding Crowd is just what the title tells us it will be, with the emphasis on human relationships. The mood of the story absolutely matches the mood of the seasons: with summer comes lust and desire, with winter comes grief and mourning, with spring comes hope and new life." The film is also a reminder of something our security obsessed generation has been lulled to forget ­– our vulnerability to catastrophe and reversals of fortune. An inexperienced sheepdog creates ruin for Gabriel Oak, who then must earn his living working for Bathsheba, the penniless lass who has now inherited her uncle’s farm. That farm, in turn, is threatened at every turn. A fire in the barn promises disaster, a fire in the heart, equally so, while violent storms of passion and the elements take their toll as well. Yet it is not how these disasters turn out so much that matters. It is how they test or strengthen our characters, who either rise to the occasion or not; they mature, endure, or self-destruct. Finally, Bathsheba is a fully realized woman. She is determined, proud, and willful; at times vain and impetuous. Brave, warm, and earthy, Bathsheba is always without pretense, a feminist whose eyes twinkle in humor rather than disdain. When it suits her, she can step down from her pride. She has the temerity to admit her flaws and even laugh at them. But most of all, Bathsheba has the ability to learn from her mistakes, and by watching her, maybe we can as well. A must see for discriminating viewers. Bathsheba inherits a large farm, but she prefers to run it herself, getting down into the sheep dip with her shepherd and his flock to help out. No large kitchen staff for her; maybe not even a cook. These Lemon Curd Tarts are just the simple pastry she might turn her hand to ­ – that is, after she has washed off the remnants of the sheep dip. They are unpretentious and zesty, just like our independent heroine. 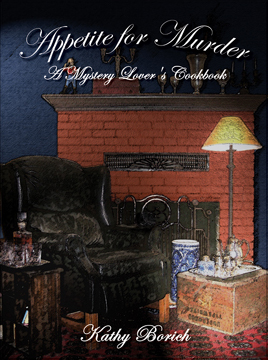 Our recipe comes from Different Drummer’s own Appetite for Murder: A Mystery Lover’s Cookbook. You can order it or download a sample from the upper left hand portion of this website. Put the flour into a large mixing bowl and rub in the butter, using your fingertips, until the mixture resembles fine breadcrumbs. Stir in the sugar and add enough water to form a firm dough. Roll out on a lightly floured board and use to line an 8-inch pan dish. Spread the jam over the base and chill. Beat the egg yolks; then beat them with the sugar until very light. Add the butter, lemon zest, and juice. Fold in egg whites. Pour over jam filling. Bake for 25 to 30 minutes in a preheated 350 degree oven until curd is set. Serve warm or cold.